XtreemFS replicates your file data across multiple storage servers, which can be distributed worldwide. Our replication algorithm is designed to cope with all the problems and failure scenarios that can occur in truly distributed systems: message loss, network partitions, server crashes etc. For each replicated file, XtreemFS keeps a list of replicas which gives you complete control where to place replicas. You can even use different placement schemes for each file. When a replicated file is opened, XtreemFS automatically elects a primary replica for that file which processes all file operations. If the primary fails, one of the backup replicas will automatically take over after a short failover period. Your applications won’t see a difference between regular and replicated file because the XtreemFS file replication is completeley transparent. In the video to the right you can see XtreemFS file replication and automatic failover in action. We used an unmodified mplayer showing a video stored on XtreemFS. In addition to regular file replication, XtreemFS provides read-only replication. This replication mode works on immutable files and supports a large number of replicas. 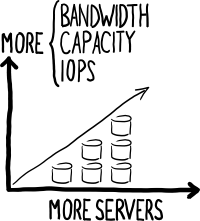 The read-only replication helps you quickly build a caching infrastructure on top of XtreemFS in order to reduce latency and bandwidth consumption between datacenters. In addition to full replicas that contain a complete copy, XtreemFS also supports partial replicas. These replicas are filled on demand when a client accesses data. You can quickly scale up or down an XtreemFS installation by adding or removing new Storage Servers. An XtreemFS installation can scale to thousands of storage and metadata servers. The elasticity and scalability makes XtreemFS a perfect Cloud File System. XtreemFS supports globally distributed installations. You can quickly build your own storage cloud with XtreemFS, or you can use XtreemFS from the cloud to access external storage resources. We have designed XtreemFS so that you can easily customize it for your requirements. Functions such as storage server selection, replica placement or user authentication are controlled through policies. If you need more control than our policies offer, you can easily write your own policies and plugins. With asynchronous MRC backups you can easily create a consistent snapshot of your metadata without interrupting operations. The MRC will create the backup in background and continue to process client requests. XtreemFS has the same “Look&Feel” as NFS or your local file system. Applications and users won’t see a difference, also for replicated and remote files. You can use XtreemFS as a drop-in replacement for NFS. XtreemFS comes with built-in support for SSL and X.509 certificates. You can run XtreemFS over the internet without a VPN. XtreemFS implements striping of files over several storage servers for increased I/O bandwidth and capacity. This is similar to RAID0. Parallel I/O ensures that read/write operations are executed in parallel on the storage servers to exploit the full link bandwidth. XtreemFS supports versioned files and asynchronous metadata snapshots. Together these two techniques allow you to create snapshots of a volume instantaniously. The XtreemFS client can cache metadata to speed up interactive use, e.g. from your shell. This feature is particularly useful if you mount volumes over the WAN or slow links like DSL.